Vegetarian Black Bean Chili made with Larry’s All Natural Ranchero Taco & Enchilada Sauce is a flavorful blend of vegetables, beans and sauce that everyone will enjoy. 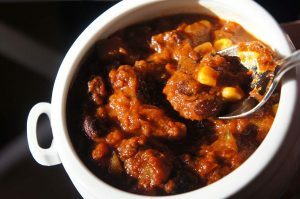 I invented my Ranchero Sauce when I was a chef in a vegetarian restaurant and this chili recipe was always a favorite. Heat the oil in a medium saucepan and add the zucchini and corn. Cook for 2 minutes. Add the black beans and Larry's Ranchero Sauce. Bring the chili up to a boil, turn the heat to low, cover the pan and cook for 15 minutes. Serve with cornbread or tortilla chips.